Album pages combining fine calligraphy with borders richly illuminated with floral and animal motifs were a favorite Mughal art form as early as Jahangir (1569-1627). During this time, the precious albums assembled from various sources (muraqqa), became popular at court and somewhat supplanted the illustrated book. The taste and expertise of its compiler, rather than the talent of a single artist, determined the range of theme, artistic quality, and coherency of an assembled album. 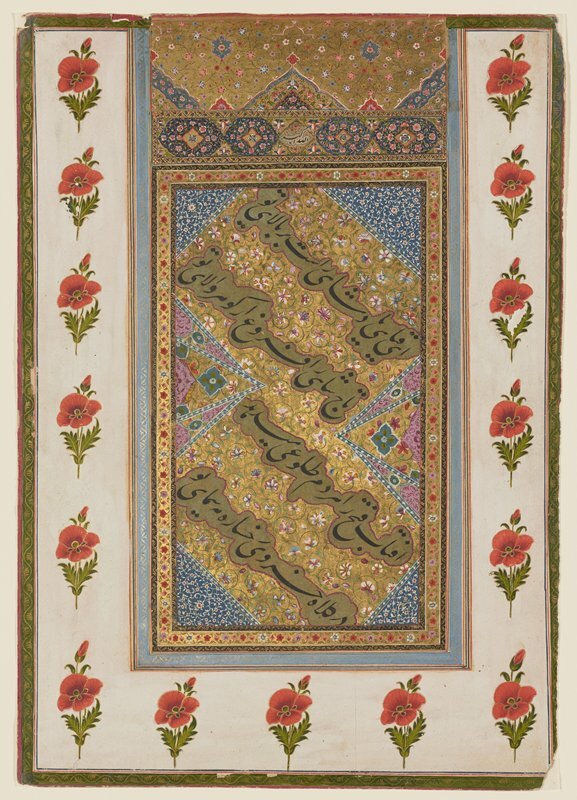 This page shows four lines of graceful nasta'liq script set against a minutely rendered, scrolled floral background of gold and blue, approximating the Persian manner. The white borders, however, punctuated with carefully painted poppies, reflect Mughal court taste of the seventeenth and eighteenth centuries.